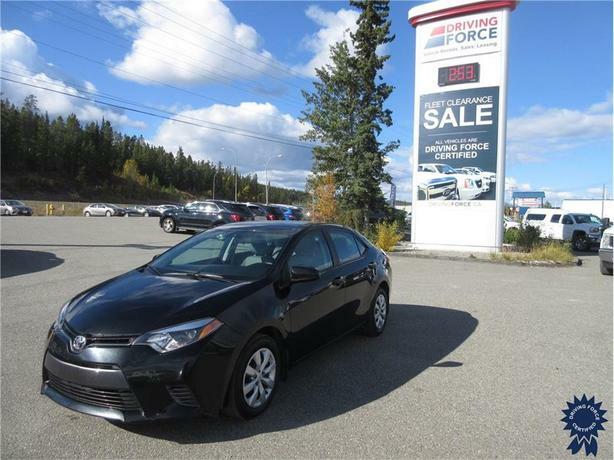 This 2016 Toyota Corolla LE 5 Passenger Front Wheel Drive Sedan comes with a continuously variable transmission with Intelligent Shift, 4.76 axle ratio, 80-amp alternator, 50-litre fuel tank, 16-inch wheels with wheel covers, Bluetooth for phone, remote keyless entry, power door locks, power windows, heated mirrors, heated front bucket seats, backup camera, rear child safety locks, and one 12V DC power outlet. The 1.8-litre 4-cylinder gas engine provides 132 horsepower at 6,000 RPM and 128 lb-ft of torque at 4,400 RPM. Touch base with us to discuss purchasing or financing options that are right for you and experience the difference you will only find at DRIVING FORCE Vehicle Rentals, Sales and Leasing.